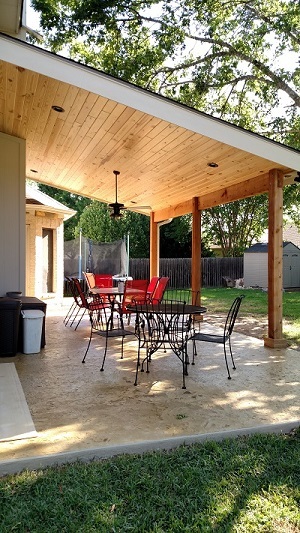 Cedar Park, TX, Homeowners Love Their Covered Patio Upgrade! You might think that replacing a covered patio and shed roof with a new covered patio and shed roof was swapping like for like, but not in this case! The difference is so remarkable it’s hard to believe the before-and-after structures are both called the same thing. The two most significant changes we made were to … you guessed it: the patio and the shed roof. 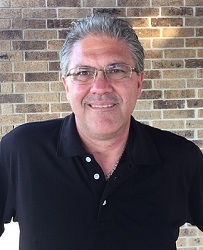 We replaced the existing patio with a larger one, and we replaced an aluminum shed roof that was flat with a shingled roof that has a bit of a pitch. It’s amazing what a difference that simple design change makes. As you can see in the photos, the original patio extended about two-thirds of the way across the back of the house. We designed the new patio to run the entire width of the house, and we also extended it to reach deeper into the yard. The homeowners now have plenty of room for not just one but two dining tables and chairs, a smoker and a grill. Most of the patio is covered by the new shed roof, but a portion of it is uncovered for those days when the homeowners will enjoy sitting in the warmth of the sun. The new patio has a beautiful stamped and textured concrete finish. To give the patio extra stability, we laid a grid pattern of steel rebar before we poured the concrete for the patio. We also dug a small trench beneath it to run conduit for the electrical wiring needed for the outdoor lighting and ceiling fan over the patio. The new shed roof is shingled to match the home’s original roof. With a roof pitch under 4:12, we were required to install a special underlayment or sheeting beneath the shingles. This special covering is a water-proof “ice and water membrane” to prevent moisture from running under the shingles and causing damage to the wood. The membrane self-heals from any puncture or penetration, including nail holes. If you’re on the patio looking up at the shed roof, what you see is a beautiful tongue-and-groove ceiling in ponderosa pine from Synergy Wood Products. Instead of a wood stain, the ceiling wood was prefinished in a clear sealant that reveals the beauty of the wood. 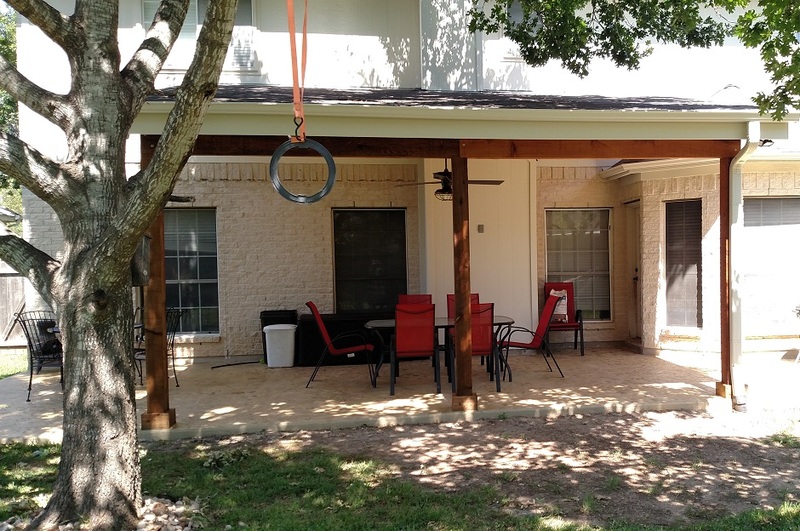 You’ll also see the new ceiling fan we installed and the recessed lighting that will make this patio the family’s favorite spot, day or night. 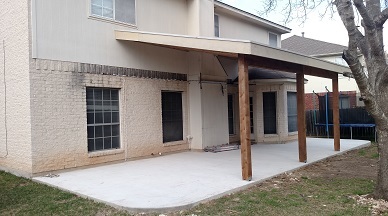 While we were replacing the patio and shed roof, we also replaced siding on the back of the home’s fireplace, and we cured a growth of mold on the brick wall where the old aluminum porch cover had been attached to the house. Repainted, the brick wall looks new as well! This project reveals what a difference a good design can make, along with an upgrade in building materials. These homeowners didn’t realize how much they wanted a new patio and shed roof until they saw how good this looks! 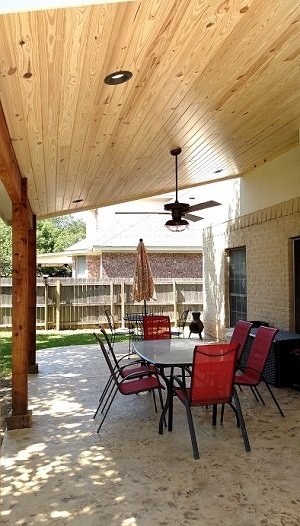 If you need a covered patio upgrade, or a new patio and porch combination project, contact Archadeck of Austin today at (512) 259-8282 or via email at [email protected] to schedule a free design consultation.